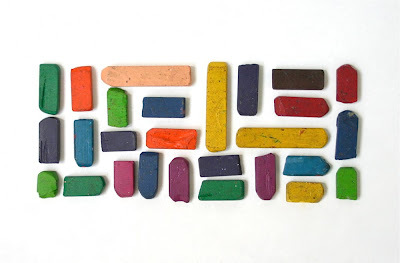 Vintage crayons (part of larger school supply collection). Hi, I'm from Brazil. I love your collections and your idea of this blog. I like the way you look the objects, mix colors and placement. Beautiful! Love this. I think it would look great as a print. Colors like this were way before my time. I like how these mirror the image of the dry cleaning tags. They also seem very close to the palette you use in your art, nice indeed. I really like your photo. Can I use the image as part of my new blog's header? This is a non-commercial, personal site: lotfortynine.org (still under construction).